"It is low tide, and the wet sea-worn wall is glittering in the morning sun. The fishermen spread out their nets along the rampart, where they can all day hang and dry; or mend other nets under the shelter of the cottage-eaves, beside windows smothered in fuchsias and myrtles. 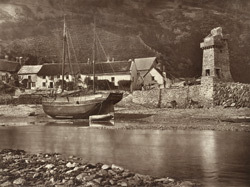 The picturesque old tower, worn by the wasting sea-breeze, and crumbled by storms into holes and fissures, stands like a sentinel looking out across the sea: as if listening always to the continuous uproar made by the junction of the tumbling streams on the one hand, and the long swell of the Atlantic waves washing the pebbly strand on the other." Text by photographer Stephen Thompson from his book 'Studies From Nature'.